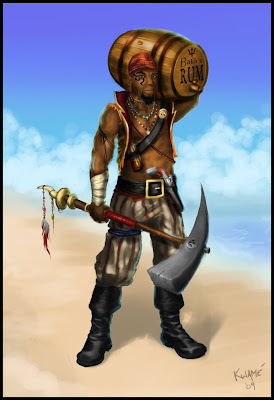 Schell Games Art Blog: I'll tell ya where de rum went!! No rum betta den dis man rum from De Rock! Challenge's almost over lads and lasses. Get ya bums on the ship, cap'n says we set sail with the sun! This came out sweet! I dig the tribal ornaments on the end of the weapon! Well done sir! Tis a good barrel to be sure if this lad's the one made it!